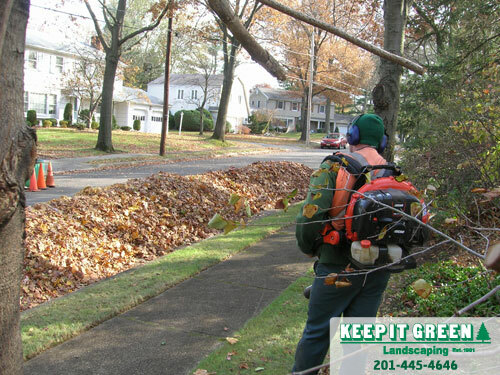 Keep It Green Landscaping provides the Ridgewood, Glen Rock NJ area with professional lawn services including leaf cleanup. Call today! Let’s face it, cleaning leaves is hard work; add to that rain and gusty winds and cleaning leaves may not be on your list of fun things to do. We can give your home a clean fresh look with our spring leaf clean up service. We’re specialists; we have been cleaning properties for over 35 years. We have the latest in modern equipment to get it done right. Call now to set up an appointment for you spring leaf clean up or any other spring planting needs you may have. Leaf cleaning service provided in Ridgewood, Glen Rock, Rutherford, Paramus, Wyckoff, Midland Park, Hasbrouck Heights, Wood Ridge, and Bergen county. Call today to schedule your spring or fall leaf clean up. On Site Examples of Keep It Green Landscaping's Leaf Clean Up Service. Our fall leaf cleaning service is tailored to your town’s leaf pick up schedule or you can take advantage of our Clean & Cart Service for the cleaning and removal of your leaves. Each year we will only take a limited number of leaf cleanup only clients. Call now before it’s too late and we’re all booked up. Serving Ridgewood, Glen Rock, Fair Lawn, Wyckoff, Paramus, Hasbrouck Heights, Rutherford and Bergen county. Why not become a full service client?